Finding a solution to the common problem is the slogan for many SAAS companies. As internet world evolves we are coming up with new problems. For example, at first we have to remember one or two passwords, but now we have to deal with tons. After the data privacy issues, we have to keep on changing our password at least for our satisfaction. Softwares like 1Password and LastPass find the solution for that. 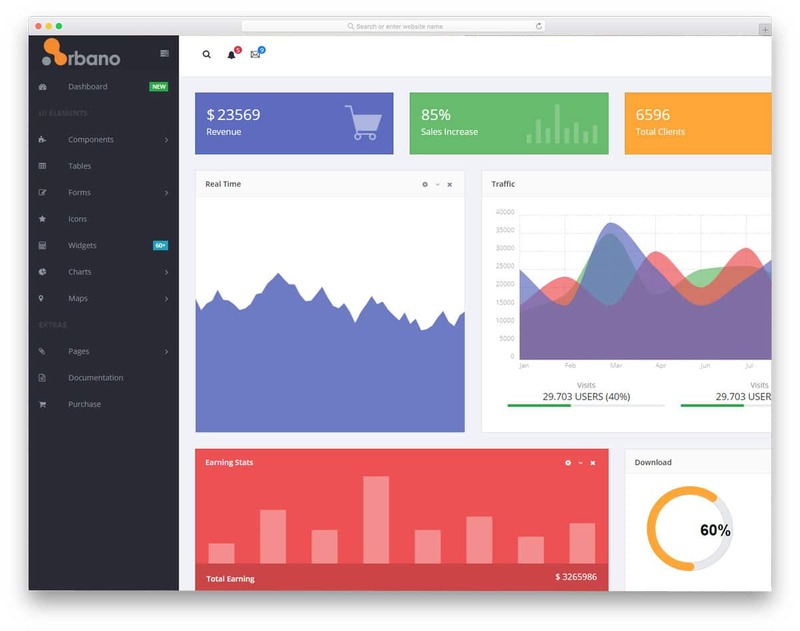 If you are one such SAAS company, who loves solving problems and wish to create an awesome dashboard for your application, these free responsive Bootstrap Admin templates can help you. 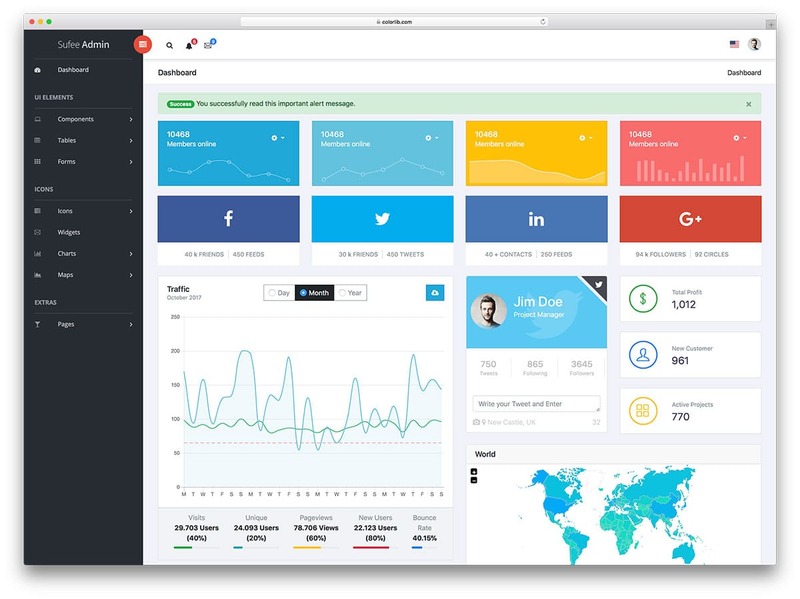 These free responsive Bootstrap Admin templates give you plenty of options and elements. Some free templates give you loads of options while some freemium type templates give you great design but only limited options. We have collected both types of free responsive Bootstrap Admin templates in this list, take the one that fits you better. 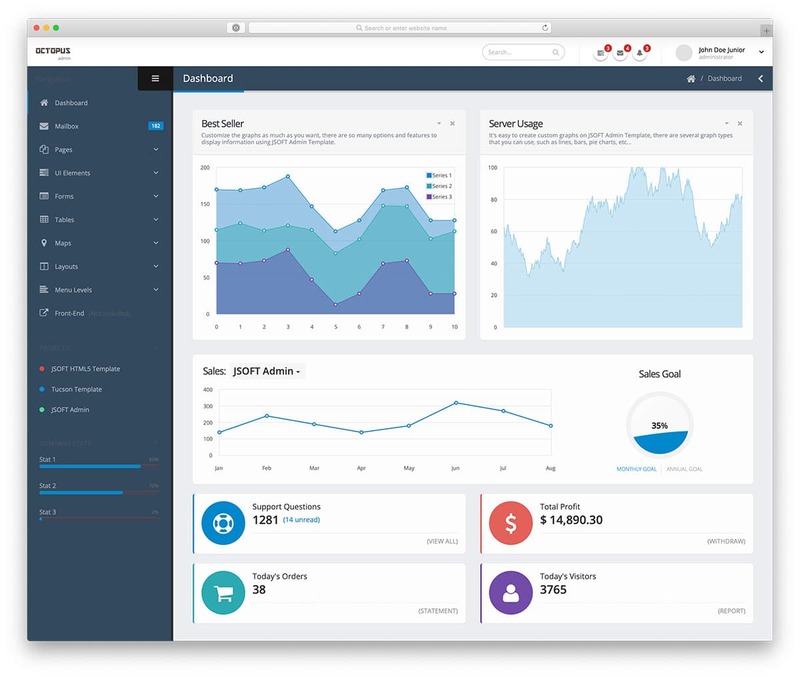 Concept is one of the best free responsive bootstrap admin templates. The creator of this template has given you all the premium features for free. No restriction on the elements and customizations. 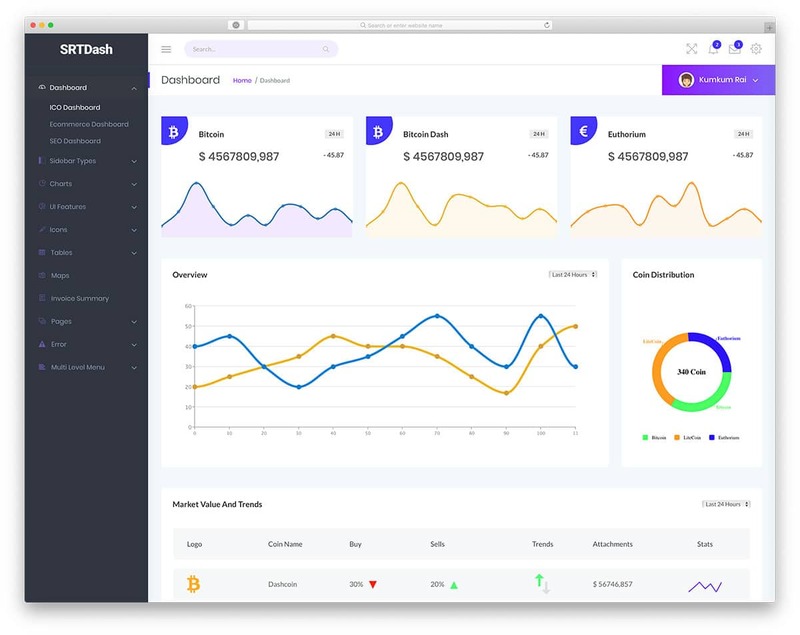 You can download the dashboard and can straight away use it to develop your own custom design for your project or website. The color schemes used in this template is cool and will fit easily in any modern websites. Charts are made colorful and interactive hover effects are made to make interaction easier with the map. In the demo itself you get dashboards designed for four concepts, just pick one and start working on it. 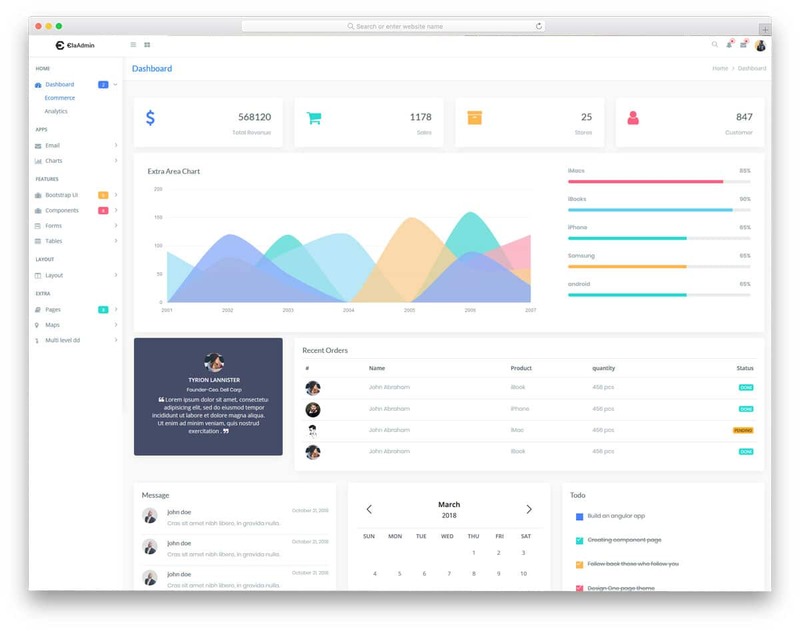 Cool admin is a stylish and colorful admin template. Each element in the admin dashboard is made bigger so that the users on small screen devices can interact with it easily. Charts are used to visualize the data, to show the accurate value of the chart visual effects are used. All the user have to do is to hover the mouse pointer over the chart. Gradient color scheme is used for the charts, which looks attractive and at the same time, it did not hinder the reading. At the top bar, you have the space to add search bar notification icons and user details. The profile settings are shown as a drop-down option. The left sidebar acts as a navigation menu bar and also gives you the space to add your logo. 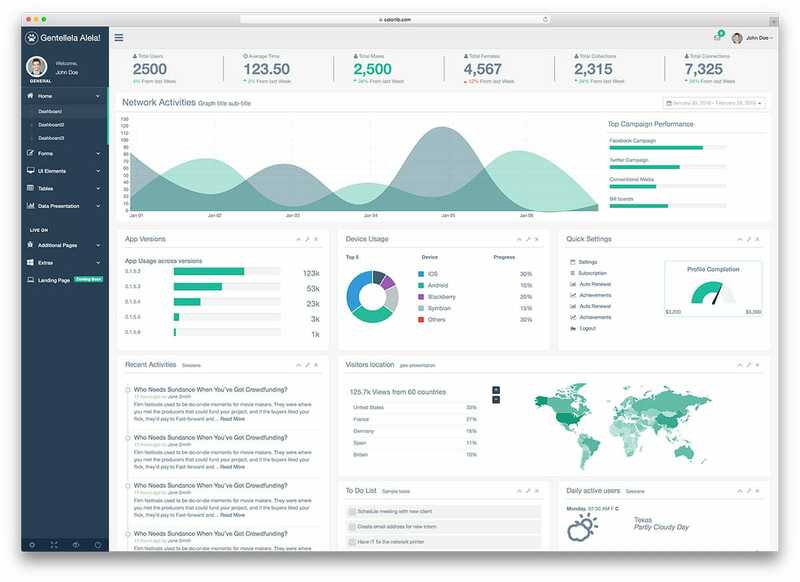 This template provides you with all the elements you need to create an effective dashboard. 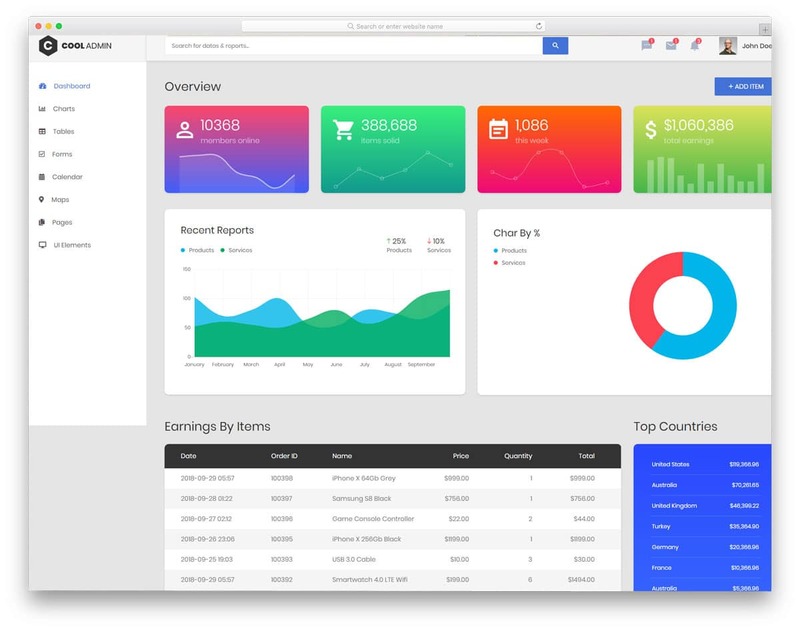 Kiaalap is a material design based dashboard template with a neat layout. The biggest advantage of the material design you get a fluid interface across all types of major devices. Since we are seeing templates for multi-device users, this template is the one you have to take a look. With this template, three dashboard variations are given. Each variation has slightly different elements. Speaking of elements, this template includes all the regular elements, charts, and forms. Most free responsive Bootstrap admin templates will restrict the number of elements, in order to make you upgrade, but this template includes all the elements you need. Visual effects are kept mild and simple so that the dashboard opens easily in the small screen devices as well. For charts, interactive hover effects are used to show the correct value to the users. Another unique feature of this template is the integrated free chat tool, Tawkto. All you have to do is to finish the setup and start interacting with the users. Apart from the dashboard navigation options you also have website page navigation option at the top bar, to drive traffic to your web pages. If you are making a dashboard for realtors, salespersons, and marketers, then this template is the best option for you. As most of the peoples in the above-mentioned person are on the field and needs the information on the go. With this responsive template, the people can see their performance and tasks on the go. All the widgets are made big so that the users can see the details neatly and also can interact easily. Live stats bars and to do list are also provided in the dashboard to improve the productivity of the employees. All the navigation options are shown on the left sidebar, which can also be shrunk to get a better look at the main content area. 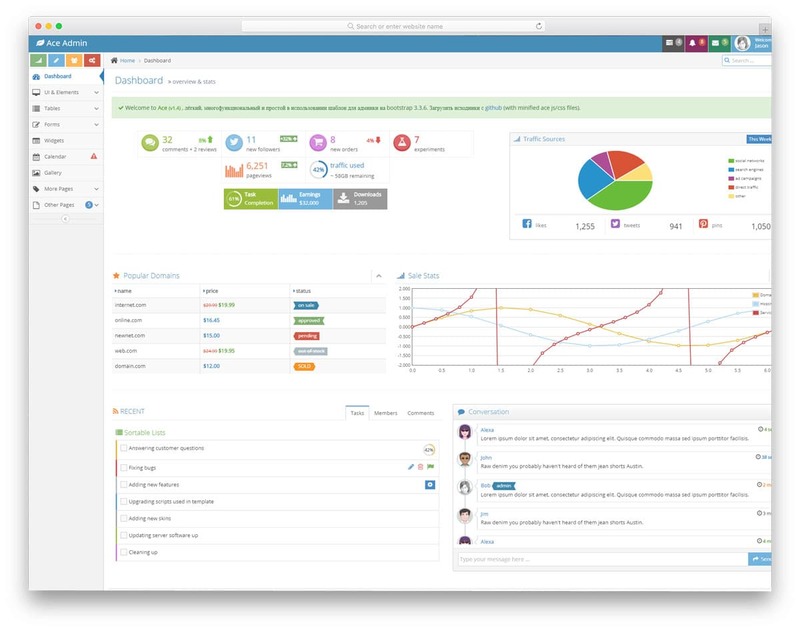 Notifications and reminders are shown at the top bar so that the users can stay updated about their new tasks and assignments. User profile options are shown in the drop-down menu. With this properly organized template, the users can easily increase their productivity and concentrate on their tasks and goals. As this template uses the latest HTML5, CSS3, and Bootstrap 4 framework, you can integrate this template with the modern tools without any worries. Adminpro is the one-stop solution for web application developers. 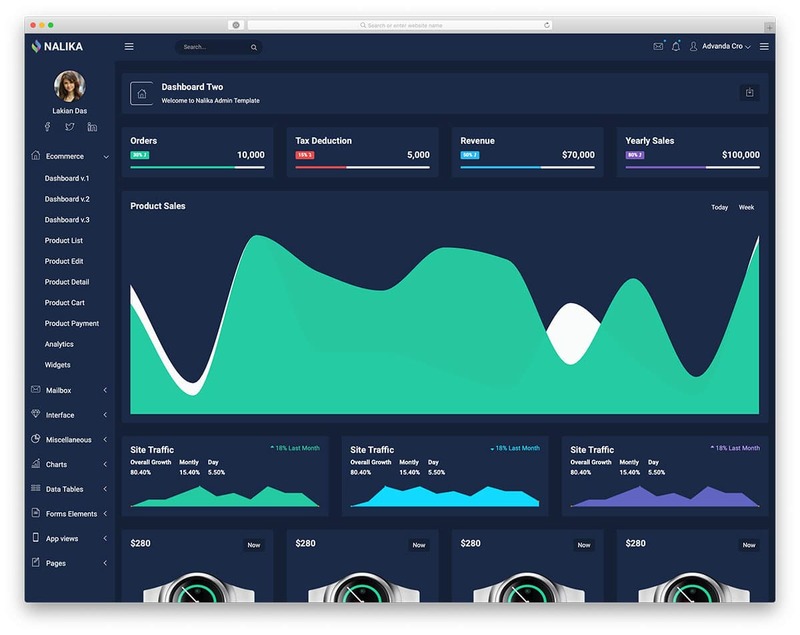 With seven dashboard variations, this template gives you all the options and features you need to set up a user-friendly dashboard. 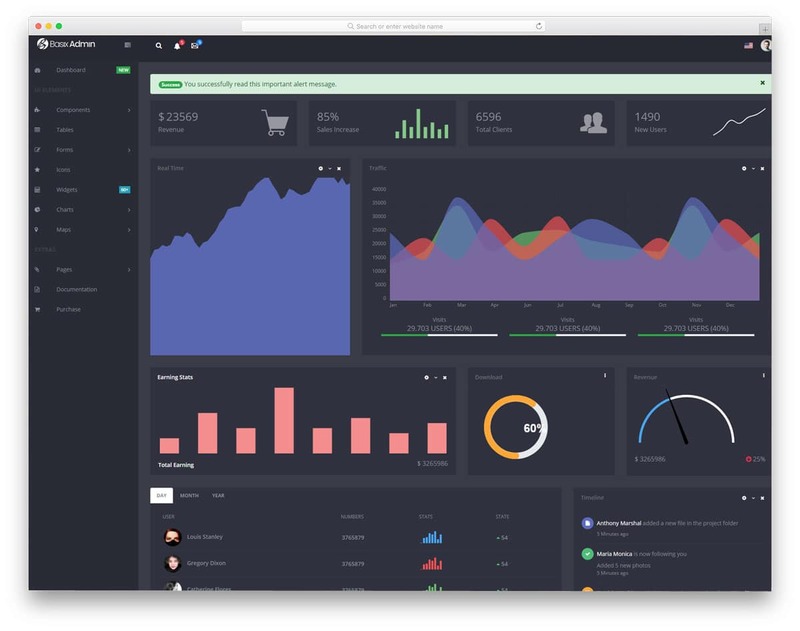 Both light and dark theme dashboards are given in the package. As the dark theme is becoming a trend among the users, you can use the dark theme design of the template. 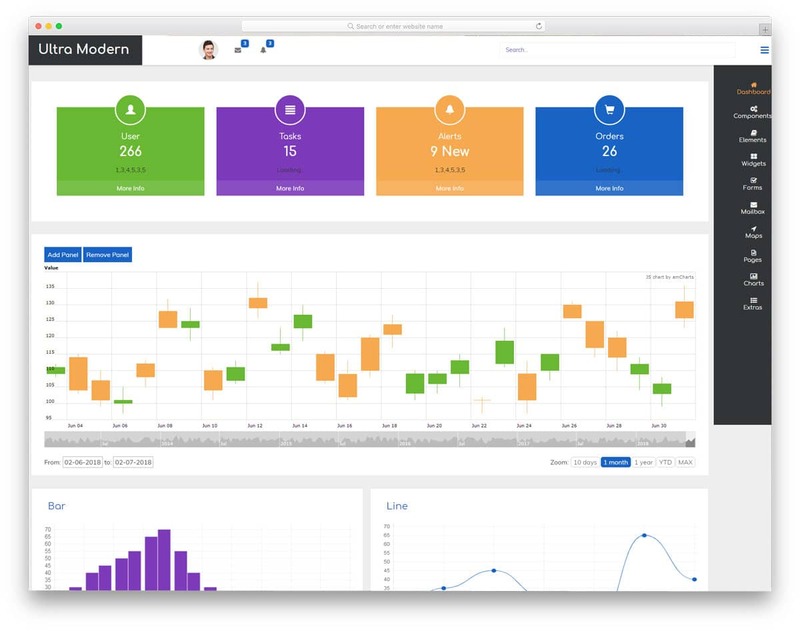 All the variations have plenty of elements and charts to help you build an interactive dashboard. As this template uses the latest CSS3 framework, the colors are more natural and lively. On the modern device high-resolution screens, these colors look vibrant and attractive. Ample amount of space is given between each element to neatly show multiple contents in one place. Different navigation options are included in the template variations, based on your needs, select the one that fits you. Mostly font awesome icons are used in the templates, so you have plenty of well-optimized icons to choose from. 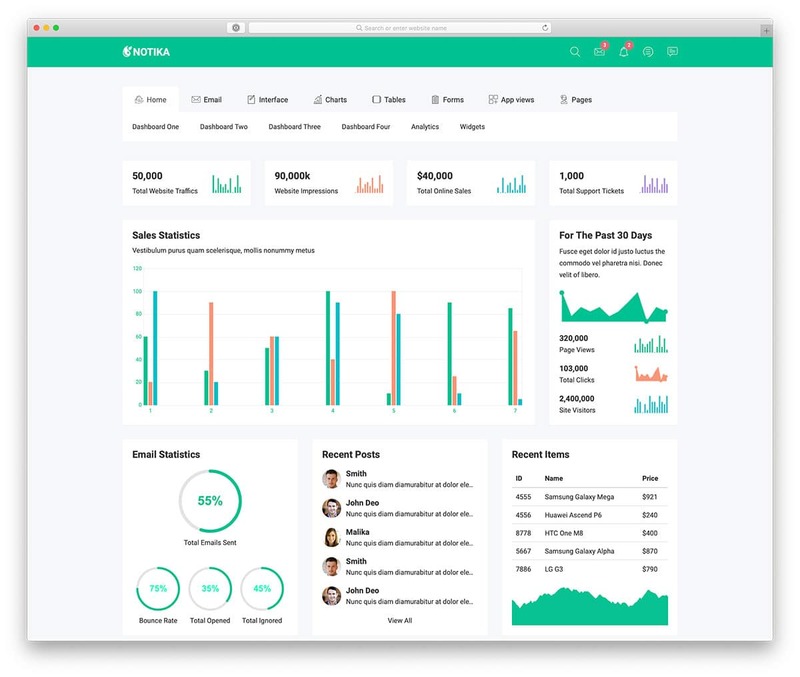 Nalika is the best dashboard template for the accounts and finance team of a company. Being in the accounts, people need to handle lots of stats and values. With this template, users can clearly visualize the stats and can have a clear data insight. 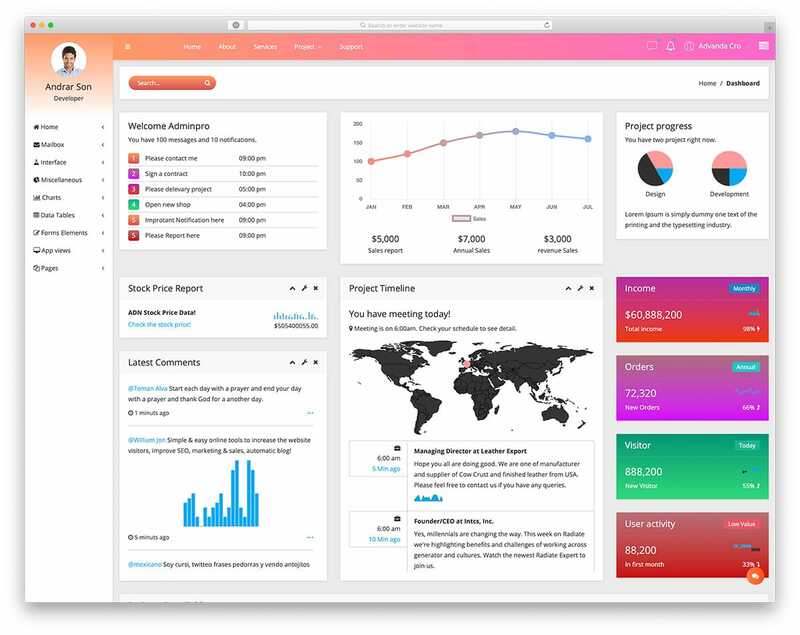 The template includes three dashboard design, with different elements. You get plenty of basic elements and charts with this template, so you needn’t worry about making one unless you have any special need. 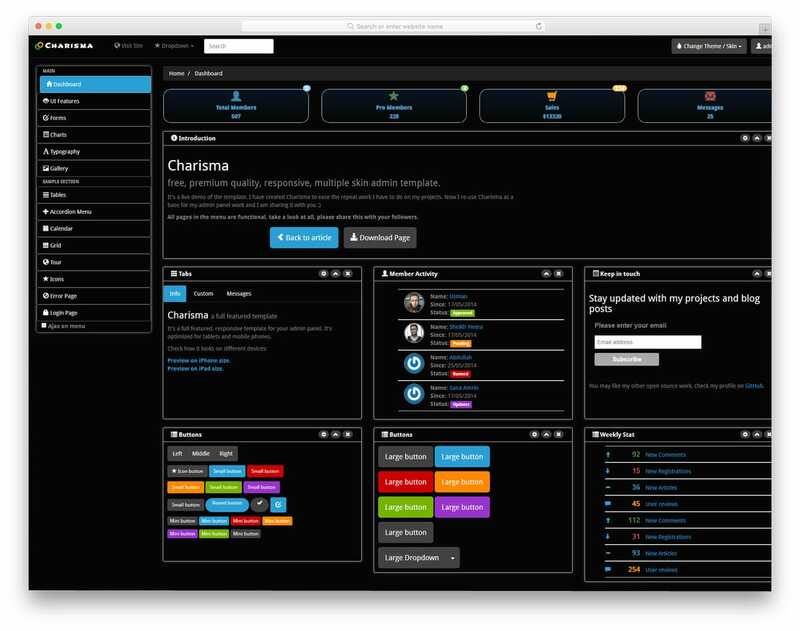 A dark theme is followed throughout the template, which makes the widgets clear and distinct. A big calendar widget is given to help you neatly organize your schedules. This template also gives you the option to add social media profile links along with a space to add a profile image. A search bar is also given at the top to help the user to easily search and find the files and sheets. Overall the Nalika is a well-thought-out template, with flexible design. 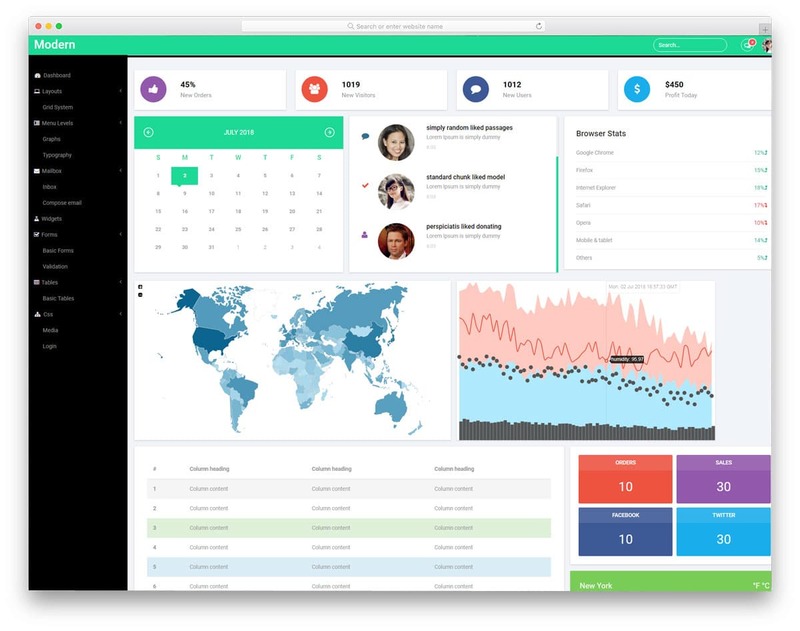 SRT dashboard is almost similar to the Kiaalap template mentioned above, except this one is more colorful. Primarily this template is designed for the cryptocurrency websites and web applications. This template also includes some unique elements for the cryptocurrency niche. For example, a currency converter and live value widget to show the market condition. As this is an HTML template, you have to take care of the backend integration to make elements fully functional. To let the user make use of the full-screen space, you have the full-page view option in this template. You can also completely hide the navigation bar to have a clear view of the widgets. At the top bar, you can show the dashboard page breadcrumbs so that the user can easily jump back to the page they like. Since you have to deal with multiple cryptocurrencies at the same time, different color schemes are used for the charts to neatly differentiate the values. 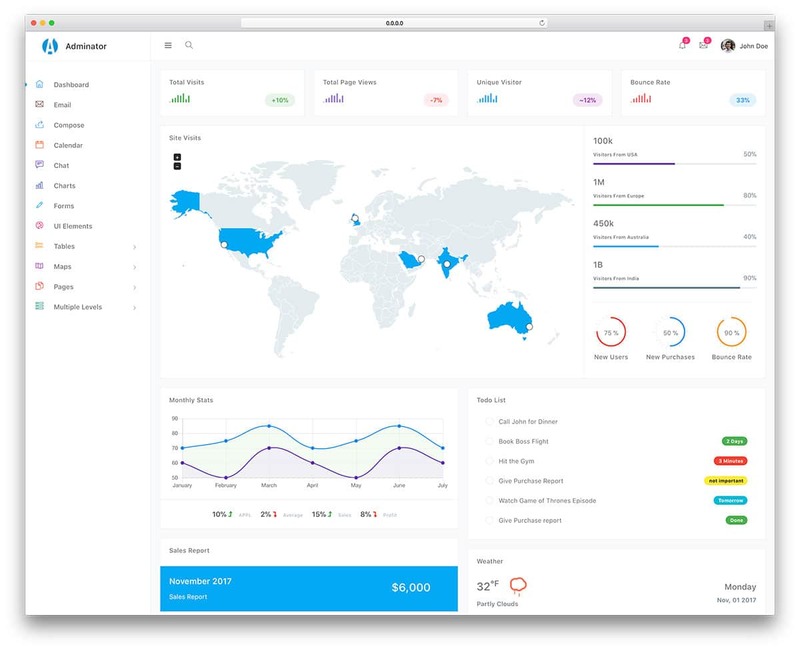 Notika is a fresh looking admin dashboard template. With the material design and new icons, this template gives a clean look to the dashboard. This template follows a tabbed interface so you might need to work on the navigation part on the mobile view. Each tab has its own unique elements and also gives you the option to list the subcategory under each category. This template also gives you the free chat tool, Twakto. If you are making this template for your customers, then the user can get the direct chat support via the integrated chat tool. As many companies are adopting chatbots to help their customers with basic inquiries, this chat tool will come in handy for many companies. This template uses the latest HTML5, CSS3, and Bootstrap framework so you can easily integrate this template with other tools without any issue. Jeweler is the light theme version of the nalika template mentioned above. 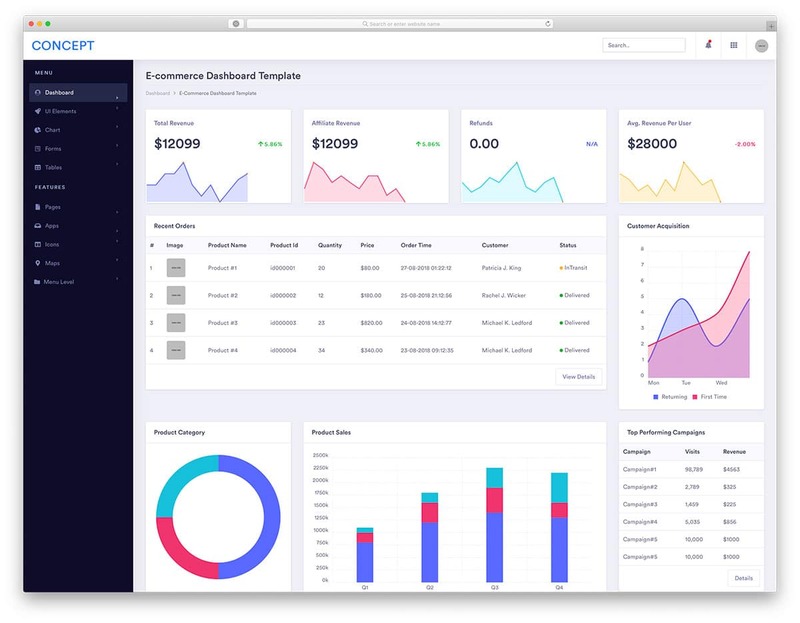 With this eCommerce admin dashboard template, the user can have a quick overview of their sales and the product stock. Icons are used to show the navigation menu options in the minimized bar, and the transition effects are smooth. Throughout the template, the effects are kept simple and clean so that it won’t take long to load. Font awesome icons are used mostly in this template, so you have plenty of icons to choose for almost all major categories. The creator of this template has shared the file directly with you so you can customize it to the way you want. Adminator is a perfect business style professional admin template. With colorful minimal design, this template helps the user to control the activity easily. The dashboard is made big enough to accommodate all the elements to improve the productivity. To make this template less obtrusive in your workflow, the animation effects are used only at the required spot. The clean white design of this template makes the dashboard elements and texts to look clear and easy to interact. The elements you get with this template are email, calendar, chats, forms, and many more. To give you even better look at the data the creator of this template given the option to collapse the side navigation bar. 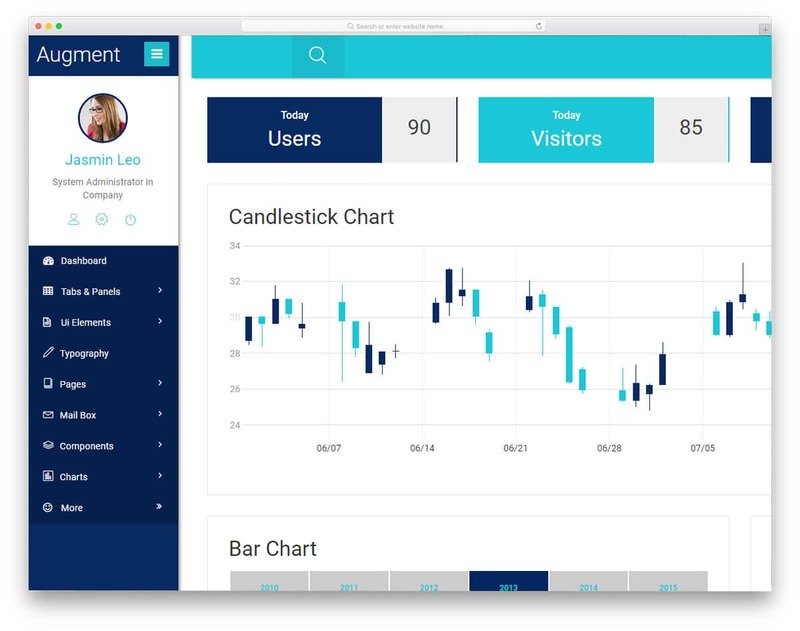 The charts are made responsive, so the user can interact via both the mouse pointer and the touchscreen devices. The default design of this template makes it the best option for digital marketers and solopreneurs. In the dashboard, you have the widgets to show the traffic details and social media profile details. The boxy widgets are made big enough to show the stats and other data clearly. If you are a heavy tweeter, this template has a built-in tweet box. From the dashboard itself, you can send your tweets. All you have to do is to integrate this template with the Twitter application programming interface (API). 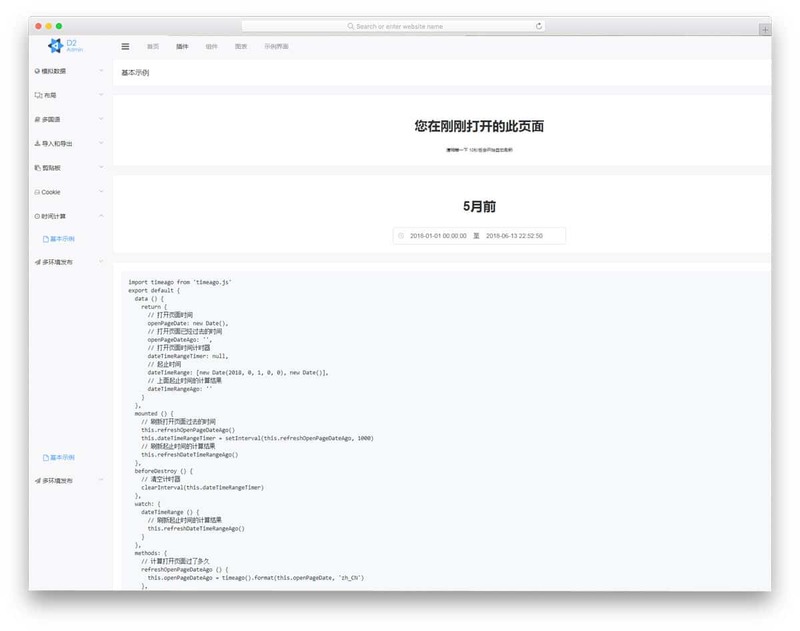 Talking about the coding, this template uses the latest HTML5, CSS3, and Bootstrap framework with industrial code standard. So the developers will find it easy to work with this template. This template also allows you to shrink the navigation menu bar to have a better look at the dashboard details. ElaAdmin is a minimal website template. The default design of this template makes it a perfect fit for the eCommerce store owners. Depth and shadow effects are used effectively to differentiate the dashboard elements from the background. Small blinking dots at top right corner gently reminds us of the new notifications. Font awesome icons are used to elegantly indicate the type of the widget. The icons are also customized a bit to match the overall design of this template. Apart from the dashboard settings, this template also provides you the option to include contact information. If you are a making this template for a web application, giving the contact details right inside the dashboard will help the user get assistance easily. 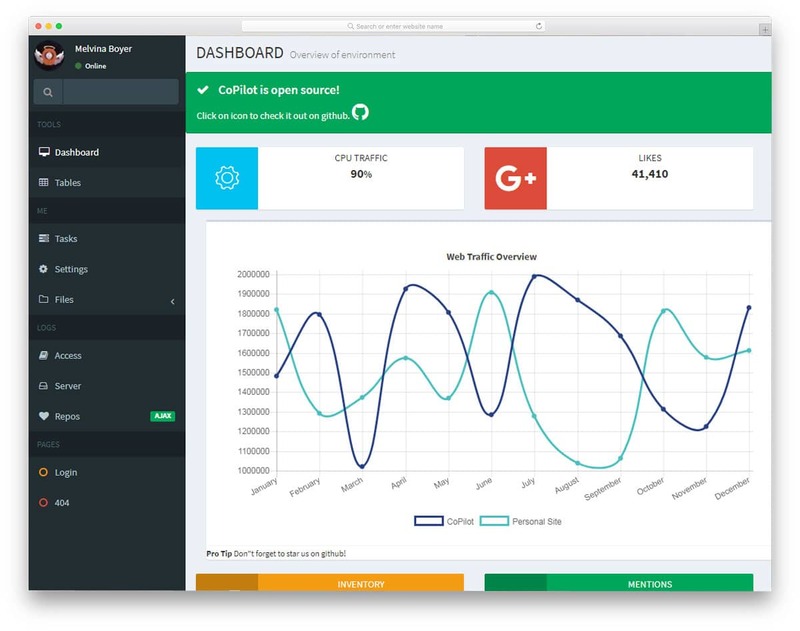 Gentelella is a content-rich dashboard template. The designer of this template gave us plenty of space to add text contents and widgets to add charts. Green and red text colors are used to indicate the stats value changes easily to the users. Visual effects are added to the charts to give an interactive and haptic feedback when the user hovers the mouse over the charts. The best part with this template is it gives you three dashboard variations. It is always rare to find different variations in the free templates. In the left sidebar you have the option to add navigation menus and in the footer, you have the space to add dashboard settings and log out options. All the settings options in this template are just for demo purpose, you have to manually work on it to make Gentelella a full working dashboard. 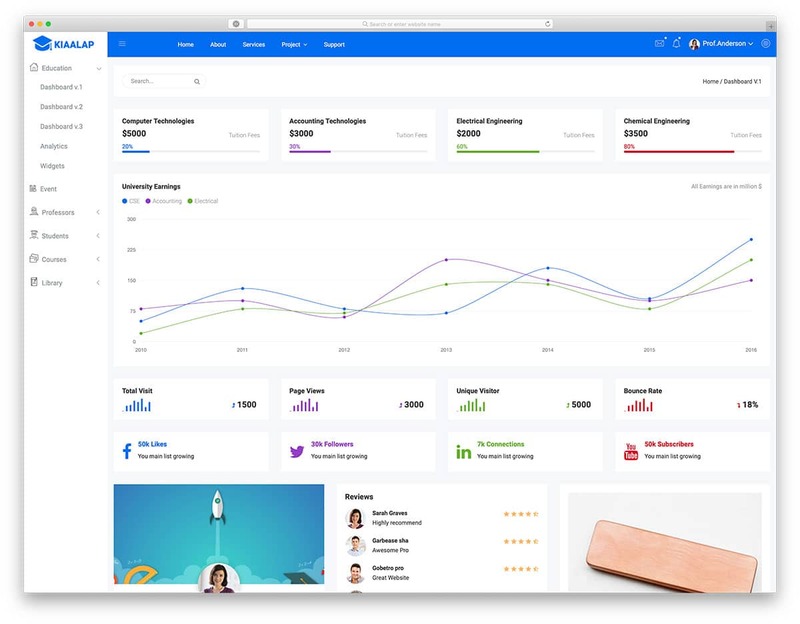 Metis is a full potential dashboard template, which you can use as a base to create your own custom website template. With this template, you get fifteen plus layout variations. If you are a developer you will find this template extremely useful to work with. This doesn’t give you a visually striking design but gives you a feature-rich template. Along with the layout option, this template also gives you the elements and charts need to create an effective dashboard. Login forms and user signup forms are also given in this template. All you have to do is to take the design you want and start working with that design. Latest Bootstrap and HTML version is used in this template, so even beginners will find easy to work in this template. 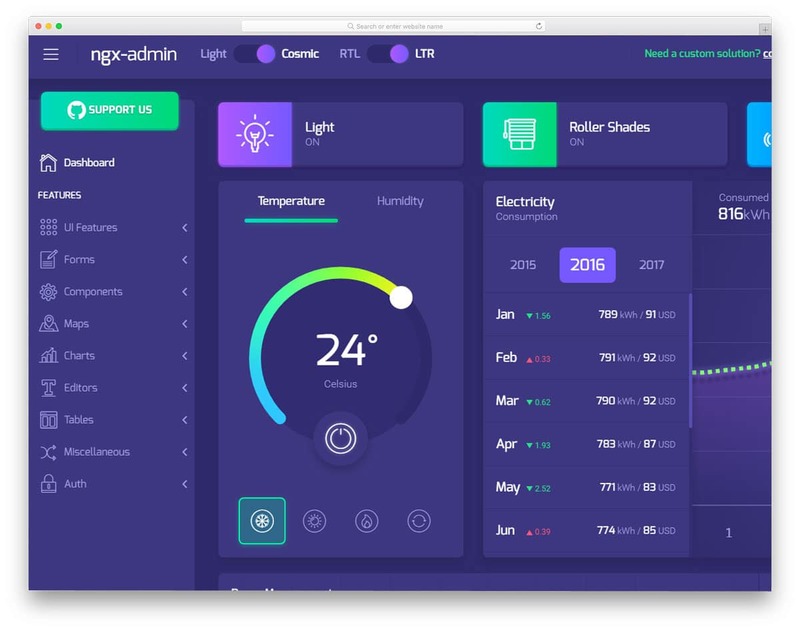 If you are in search of next-gen admin design, this template is the best one for you. Just like the Metis template mentioned above this template also gives you different variations in its design. In this template, you get variations in both CSS skins and variations. All the variations are modern and attractive, which you can even use in mobile applications. The creator of this template even given us the RTL version, if you are making a template for RTL languages this option could help you. To match the creative design of this template the fonts are also chosen with care. The texts are stylish and at the same time maintains the readability. Visual effects, on the other hand, is very minimal and is used only at the required spot. iView is another professional admin template for webmasters. The designer of this template has taken even small elements under consideration when it comes to design. This pixel perfect design is matched with the well-written code base to bring this beautiful template to life. All the settings and control options are placed in the borders and the content area is used only for the widgets. So the users will have a distraction-free environment in your dashboard. Font awesome icons are tweaked a little to match the overall design of the template. Since this template uses font awesome icons, you have plenty of icons to choose from when you are customizing this template. The full page view is functional in this template to have users better view on the stats value and other widgets on the dashboard. Vue Admin, as the name implies the creator of this template uses vue.JS to make this template. Again this template gives you all the options to create an effective dashboard. By keeping this template as a base, you can create your own custom template. This template gives you tables, forms, and charts to add in this template. The navigation menu icons can be completely hidden behind the hamburger menu bar, icons are used to indicate the options. CSS work of this template is also simple and neat. This template uses the latest CSS3 framework so you can add more lively colors and effects to this template without any worries. Acen is a flat style classic looking admin template. The solid flat colors of this template help you to clearly differentiate the elements. Animation effects are kept smart in this template, it is used only in the necessary spot and it is less obtrusive. For example, when you get a new message the message icons jump for few times to notify you and stays quiet. Another advantage of this template is the skin option Out of the box, this template supports four light color schemes and eight layout options. The creator of this template also given you plenty of elements and chart options to choose from At the top bar, you have the option to show the page breadcrumbs to easily notify the path and a search bar. Charisma is classic style boxy admin template. The unique feature of this template is the dismissible widgets. If you are done with a widget you can easily dismiss it and concentrate on the next work. Another useful feature is different skin options, you get nine skin variations with this template I personally feel the darkly and cyborg gives a bit modern look Glossy edges are used in the dark mode to differentiate the widgets from the background color. With admin elements also this template gives you all the options you need. Each widget is given their own settings options so that the user will have a complete control over the dashboard. 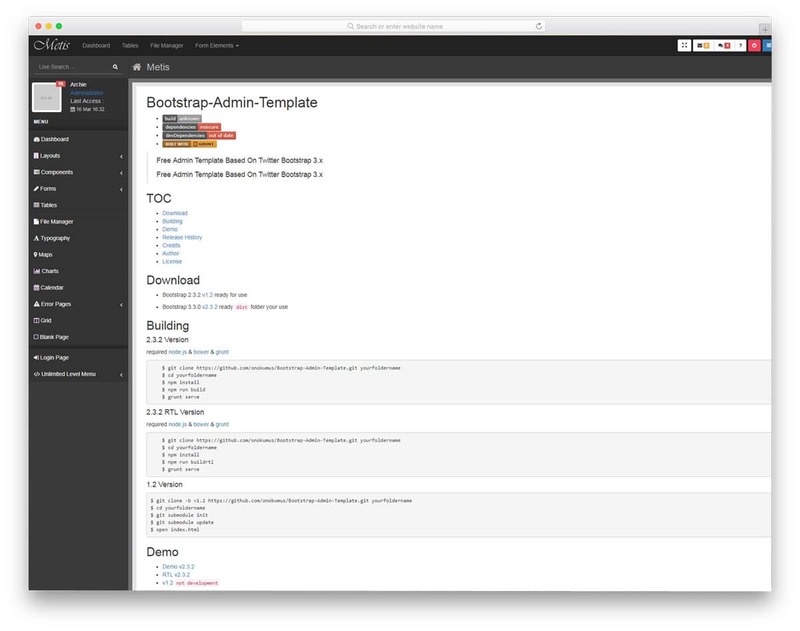 CoPilot is a big bold admin template. The full-width design of the template is utilized by the big widgets. Main dashboard area itself is responsive, it contracts and expands neatly when you close and open the navigation options Other pages you get with this template are 404 page and login page. Visual effects are used only at the loading and rest of the time it remains ideal. Repetitive animation effects will cause annoyance when the user stays for a longer time in the dashboard The creator of this template has thought about it kept the effects mild and simple. Just like in the WordPress dashboard, this template also shows alert messages and internal notifications. 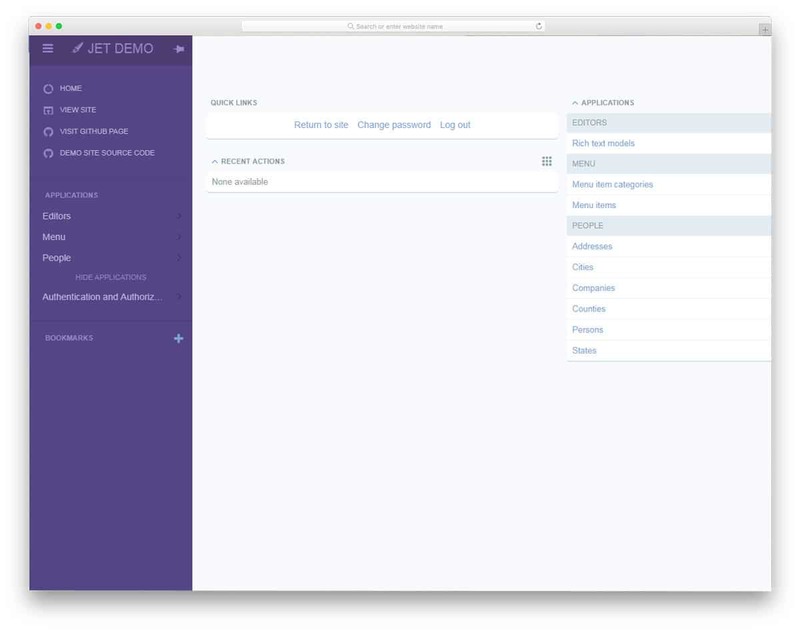 Django JET is a freemium style template. If you are a developer you can use the free version itself because in the premium version you only get technical support This template is packed with a number of customization features and some of them are unique. Most of the features given in this template are in complete working condition, so it will save some of your time The creator of this template even gives you the option to choose the widgets you want and add it directly into the dashboard. Just like the Charisma template, this one also gives dismissable widgets. Six color schemes are given in this template but you don’t get any layout options. Since it is a freemium template the elements are also very limited in the free version. 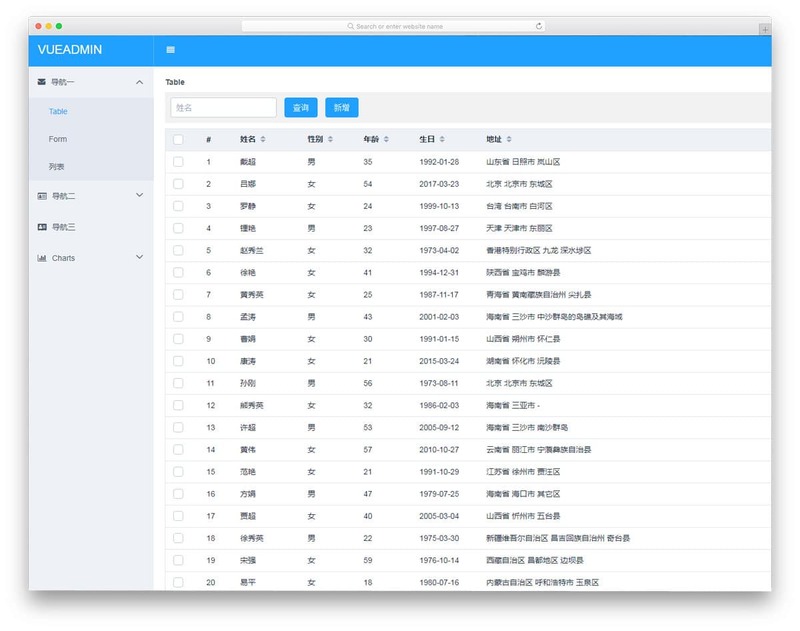 D2 Admin is a simple and clean looking admin template. With the latest HTML5, CSS3, and Bootstrap framework the developer of this template gave us a base. To give you more freedom in customization, the creator gives you a plenty of options. At the top bar, you have the control options like the full-screen view, account settings, and skin selection. Out of the box, this template is packed with four background variation. The skin concept is almost similar to the Gmail web application. You can even let the user select their own background image to give a personalized touch. Overall the D2 Admin is a fully featured and flexible dashboard template, you can use this as a base to create your own custom template. Sim Dash is a bold looking admin template with chunky borders. Thick borders are used to control settings and other related options. Flat style design of the template gives a modern look and if your existing website template follows the same flat style design, this template is the best option. This template also allows you to close a widget after completing your task. Giving a undo option would be great because sometimes the user may accidentally close the widgets. Still, the user can get the widget from the menu, but giving a undo option will save some extra clicks The design of this template is clean and let the user see what they want. Shadow effects are used to differentiate the widgets from the overall flat design. Arbano is from the same creators of the Sim Dash template mentioned above. It is a freemium version in which you get the light skin design alone. After the release of macOS Mojave, most web applications will be adopting dark mode. If you want dark skin in this template you have to go for the premium version or you can work on the CSS file by yourself. Animation effects are simple and are used only at the required spots. Font awesome icons are used throughout the template. Even if you customize this template, you have plenty of font awesome icons to choose from. Just like all other freemium versions, this template also limits the elements you get with this template In the free version, you get only a few basic elements. This template best suits the developer. The creator of this template has shared his work in the Github. 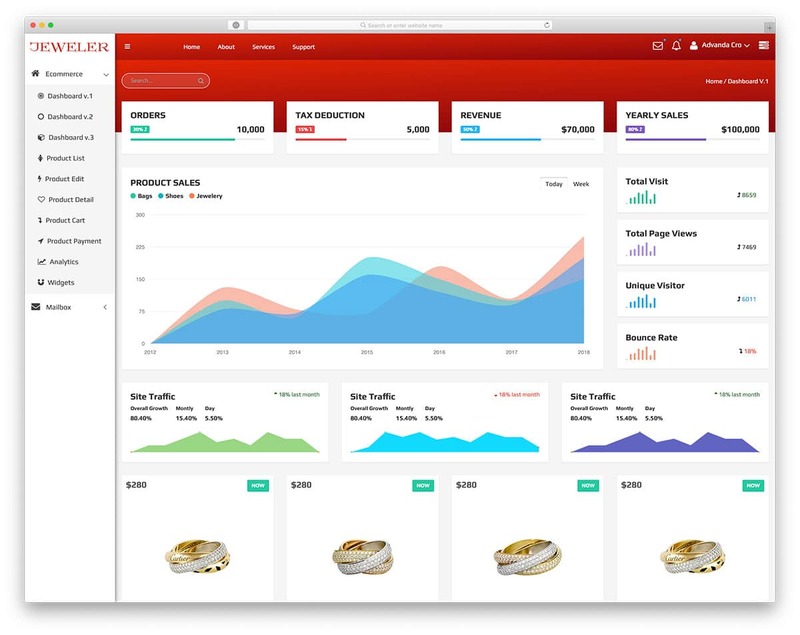 By using the code shared you have to develop your custom dashboard. This template is also available in the premium version for the general users. Light and dark versions are given in this template. Except for the skins both the template versions are similar. The main dashboard itself is made responsive, all the widgets in the dashboard adjust automatically when the sidebar opens. Since it is a premium template by default, all the base aspects of optimizations are done in this template. Elements used is also shared in the Github, which you can use for your custom admin template. 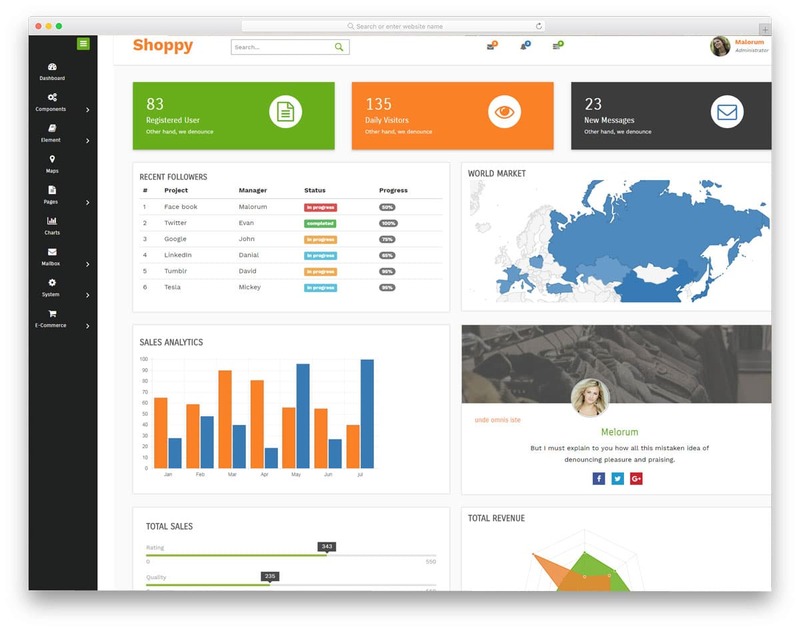 Shoppy, as the implies this admin template is designed for fashion stores and ecommerce websites. 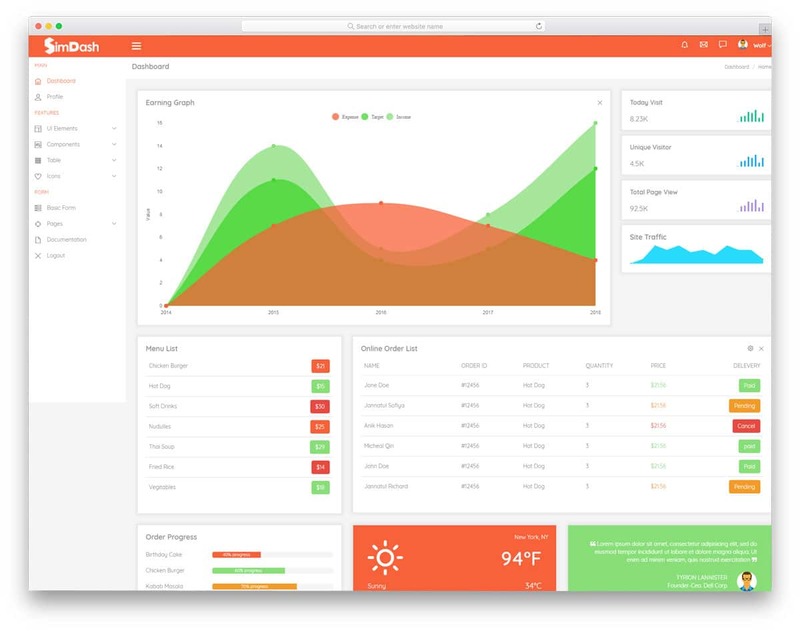 With the neat clean dashboard, this template gives us enough room to add all our widgets. 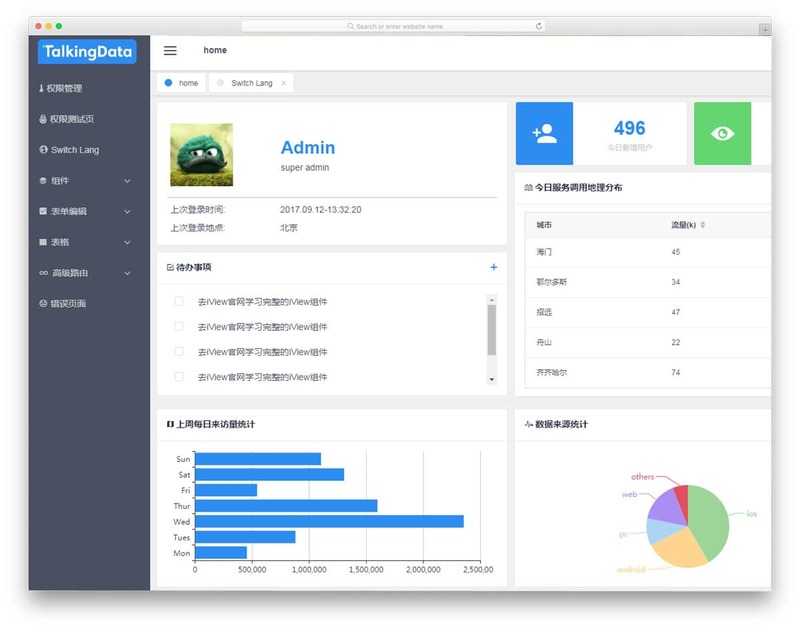 The dashboard is also made long enough to add big content blocks so that the user can get an overview of their account in a glance. Since this template is designed for the online store you also get ecommerce related elements with this template At the top bar, you have the space to add search option, notification icons, and profile picture Below the profile picture, drop-down options are used to show the account settings. Augment is a neat professional looking admin template for business use. This template only uses two color schemes and is maintained throughout the template elegantly. If you already have a color scheme for your website, you can change it accordingly. This template uses the latest CSS3 framework, so making the look of the template similar to your existing website template will be an easy job The sidebar navigation bar includes the navigation options and profile information. In the sidebar itself, the profile details and related settings options are given so that user will find it easy to reach the controls. As per the name, the designer of this template makes it look modern and clean. In the demo version, you can see most of the widget in the dashboard are charts. This template is packed with different types of charts to help you visualize data and stat value effectively. Most of the free responsive bootstrap admin templates in this list have a navigation bar in their left, but this template has it in the right sidebar Visual effects on this template are simple and clean; used only at the required spot. Flat colors are used in this template to match the simple design of this template. Modern, this template is also from the creators of the Ultra Modern admin template mentioned above. Each widget in the dashboard is made large enough to show the contents neatly to the users. To add justice to the name of the template, modern color scheme, and the web elements are used. Message notifications are also included in the demo version If the admin has to manage many numbers of teams, message options within the dashboard will be of grateful to them. Elements wise, the developer of this template gave us all the basic elements to create your own custom admin template.